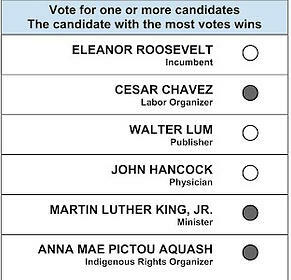 Approval voting is a single-winner voting method that allows voters to choose any number of candidates. The candidate chosen the most wins. Approval Voting is most often discussed in the context of single-winner elections, but variations using an approval-style ballot can also be applied to multi-winner (at-large) elections. How would approval voting results differ from plurality voting results? Political scientists in France and Germany conducted two large-scale approval voting surveys based on their real elections. These studies further support the positive effects of approval voting. For instance, voters using approval voting largely chose to vote for more than one candidate (i.e. they didn’t widely bullet vote). Also, the candidates showing scant support under plurality voting were better represented under approval voting. Their supporters were able to safely vote for them, even if they had also cast votes for more electable compromise candidates. Does approval voting help major parties or minor parties? While this may sound impossible, we contend that Approval Voting is fairer to both major and minor parties. Under the current system, popular major party candidates sometimes lose when a strong minor party or independent candidate draws some of the support that would have otherwise been theirs. Approval Voting addresses this by allowing supporters of alternative candidates to also support a more electable frontrunner as a compromise. Additionally, alternative candidates get an accurate level of their support. One alternative voting experiment surveyed voters at polling places in Manhattan’s 69th State Assembly District. The group was granted credentials from the NYC Board of Elections to conduct the exit-poll style experiment inside the city’s official polling places. The experiment compared Plurality Voting (traditional “vote for one” method) with Approval Voting, Score Voting and Instant Runoff Voting. Below are graphs revealing the totals for these four systems. Let’s first look at the Plurality Voting results, to establish a baseline. See our in-depth article on approval voting and independents/third parties. See how approval voting plays in with Duverger’s Law. How will approval voting help spoiled ballots? Approval voting experimentally results in about a fifth as many spoiled ballots. The only way to spoil an approval ballot is to make the ballot unreadable—rather difficult. In fact, in the French and German studies referenced above, fewer than 1 in 200 ballots were spoiled. Plurality voting ballots are treated as spoiled whenever voters mark more than one candidate. The fact that voters do this tells us that they have more to say than Plurality Voting permits. Consequently, in the 2000 U.S. elections, nearly two million ballots were spoiled—almost 2%. Does approval voting violate one person, one vote? No. The term “one person one vote” refers to the weight of votes, not to how votes are expressed. The U.S. Supreme Court made the “one person one vote” rule explicit in Reynolds v. Sims (377 U.S. 533). The rule stated that no vote should count more than any other so that it has unequal weight. This unequal weight would violate the Equal Protection Clause of the Constitution. And it was Baker v. Carr (369 U.S. 186) that extended the Equal Protection Clause to districting issues. In Reynolds, the state of Alabama set up its districts so that they varied wildly in population. The districting was so bad that it gave some voters’ ballots as much as 41 times more weight than others. Because the weights of the ballots were different between districts, that violated the “one person one vote” rule. A common misconception is that Approval Voting gives more weight to voters who vote for more candidates. To see why this isn’t the case, imagine a tied election between a liberal and two conservatives. Bob casts a vote for the liberal, while Alice casts an opposing vote for the two conservatives. After Bob and Alice have voted, the election is still tied. Bob and Alice have an opposite but equal effect on the election. Another way to think of it is that if you vote for all candidates, that has the same effect as not voting at all. The key here is that no voter has an unfair advantage. Effectively, every voter casts an “aye” or “nay” vote for every candidate. Finally, consider that voters are already allowed to vote for multiple candidates in “at large” races. For instance, a city council may simultaneously elect three representatives. Some voters may vote for three candidates, while others may vote for only one or two candidates. But what about instant-runoff voting? Our extensive analysis over the years overwhelmingly supports the view that Approval Voting is a much simpler and more democratic system than IRV (also referred to as ranked-choice voting, or RCV). The results of Approval Voting elections are also much easier to understand than the numerous rounds of vote transfers that IRV utilizes. In an Approval Voting election, you would only see approval percentages and total votes for each candidate — much simpler than IRV. Don’t take our word on it. 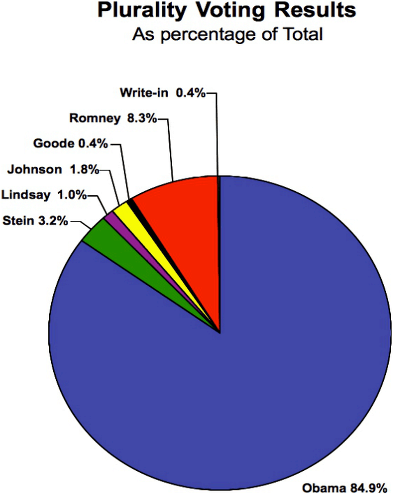 Click below for the Oakland 2010 IRV election results (simplified to show just later rounds). Do you think voters easily understood this? We have a more in-depth article comparing IRV and approval voting. Does approval voting increase voter satisfaction? 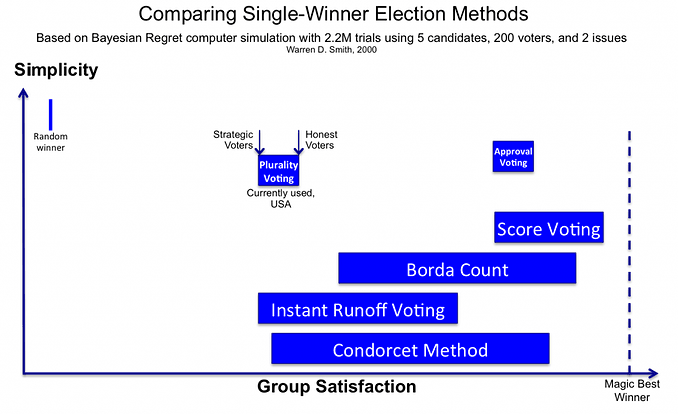 Computer simulation studies show that Approval Voting is superior to IRV as measured by “Bayesian regret“, an objective “economic” measure of average voter satisfaction. The following graph, adapted from page 239 of William Poundstone’s book Gaming the Vote displays Bayesian regret values for several different voting methods, as a function of the amount of tactical voting. 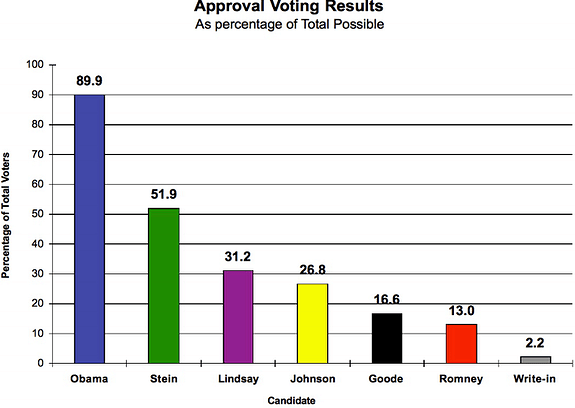 What about approval voting's progress? In November 2018, Fargo, ND passed a ballot initiative that made it the first city in the US to implement Approval Voting. Check out our progress and usage page to learn about where else Approval Voting is used.